School is out for the summer! It’s a time for students to celebrate and many parents to start looking forward to the fall. At Community Financial, we helped with the party last week by hosting two “School’s Out Celebrations” with radio station WYCD at our Canton Center and Plymouth branches, where we treated kids to pizza and all kinds of fun activities. But just because school is out, it does not mean that the learning or saving has to stop. The Community Financial School Credit Union Program remains open and active all summer long. In fact, students can get double deposit punches every Tuesday in the summer at their nearest Community Financial branch location. Over the course of the 2011-12 school year, the Student-Run Credit Unions successfully served 1,944 students. . And, over 800 students worked to learn about various banking careers and how to run a business. The students saved a total of nearly $870,000 this year. 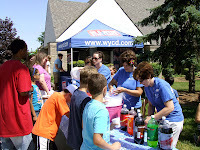 Operated in partnership with local elementary, middle and high schools in Plymouth, Canton, Novi, Northville, Gaylord, Hillman and Lewsiton, the credit unions provide students with a hands-on credit union experience emphasizing the importance of saving money and financial responsibility, as well as career skills. Community Financial staff assists with interviews and tours to cement these concepts with students. For more information on the Student-Run Credit Union Program, or our student savings programs, please visit www.cfcu.org.